NEW YORK (CNN) — Even by the standards of the anything-goes MTV Video Music Awards, Kanye West’s hijacking of country-pop sweetheart Taylor Swift’s speech at the Sunday night ceremony was particularly brutal. 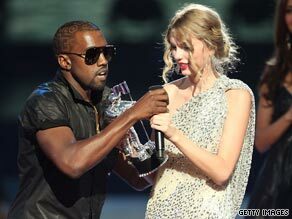 Kanye West takes the microphone from Taylor Swift at the 2009 MTV Video Music Awards on Sunday. The pre-show buzz had focused on the highly anticipated tribute to the late Michael Jackson, but West’s disruption stole the spotlight. A giddy Swift was in the midst of her acceptance speech for Best Female Video when the often-mercurial West rushed onstage, grabbed her microphone and let loose an outburst on behalf of singer Beyonce Knowles, who had lost out in that category. But audiences who stayed tuned until the end of the broadcast were treated to a touching bookend: Knowles, the night’s top winner, invited Swift onstage and gave the teen singer her moment in the spotlight. “I remember being 17 years old, up for my first MTV award with Destiny’s Child, and it was one of the most exciting moments of my life,” Knowles said, referring to the girl group with which she had her start. “So I would like for Taylor to come out and have her moment.” Speaking to reporters later, Swift was understated about her take on the disruption. “I was excited to be onstage because I just won the award. And then I was excited that Kanye West was onstage. Then, I wasn’t excited anymore,” she said. Best Breakthrough Video: “Lessons Learned,” Matt and Kim MTV told journalists the West-Swift incident was not planned — a point it had to stress after a walkout by singer Eminem at last year’s event turned out to be staged. Hip-hop superstar West, who was pictured before the ceremony swigging a bottle of Cognac, was escorted from the building after the rant, the network said. Soon after, an apology to Swift appeared on his blog: “I’m sooooo sorry to Taylor Swift and her fans and her mom,” the message said in all caps. “I spoke to her mother right after and she said the same thing my mother would’ve said. She is very talented! … I’m in the wrong for going on stage and taking away from her moment!” So went the 2009 edition of the awards, a show that is historically less remembered for its winners than for its antics. “My brother is, I mean was … You have to forgive me, because it’s really hard to believe he’s passed. Janet Jackson lost her older brother on June 25 in a blow to America’s most famous musical family. Now, for the first time since his death, the clan’s youngest sibling is opening up in Harper’s Bazaar magazine about the devastating loss and its fallout, her bond with Michael and she reveals personal memories about the King of Pop including their last hours together.